Same weather here Pat, I've just come back from Cambridge and you could feel it getting colder by the minute and the sky looks ready to tip more of the white stuff. Did someone say it was March and Spring ? On to your card and if you were outside your comfort zone, then nobody would ever know because it's stunning. The clouds worked beautifully they way you did them and the grasses with the moon behind look so elegant with an almost Oriental feel and the soft greens a prefect colour choice. Thanks you so much for making such a special card to join in my blog celebration and that you for your kind words which are so appreciated. It's lovely Pat. 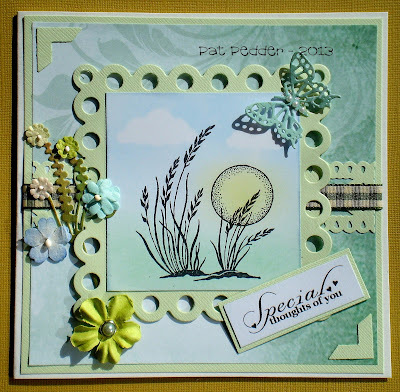 Your chalked background is perfect for the stamped image, the design and backing paper just fab. You do make the best cards Pat - always so well designed. We are kind of cool and dark here -- I have two sick goats - super busy kid - will get back to you when I can!! This is really beautiful Pat and such lovely colours. The flowers on here are gorgeous Pat -- so exciting to be getting your blog in my mail box!!!! Beautifully done but that is no surprise to anyone!! 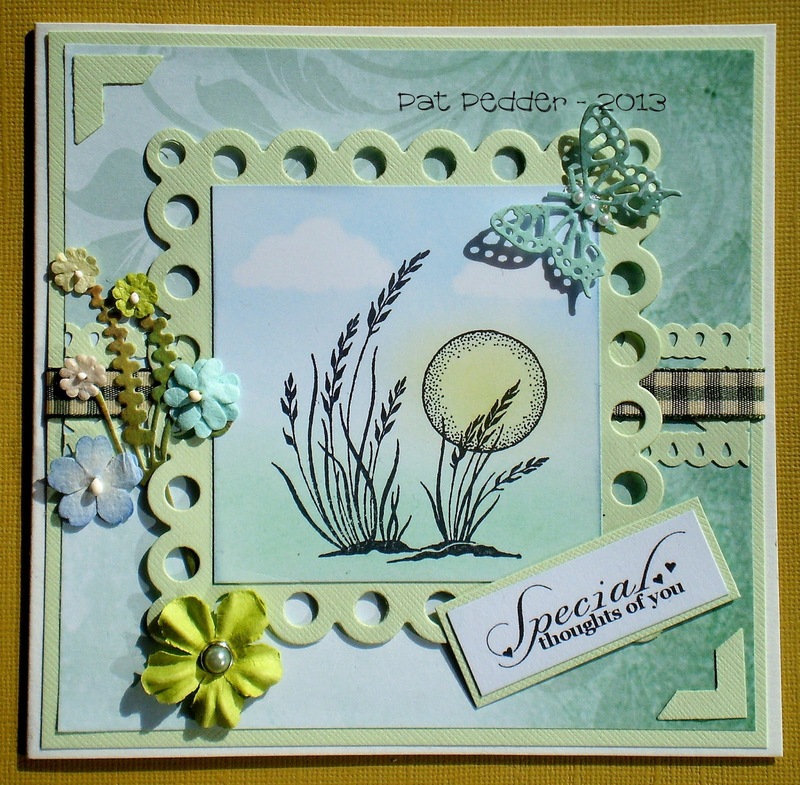 Absolutely gorgeous Pat, love your scene and soft colouration. Your colour combo, design and floral detail are fabulous.